Elle is featured in the digital magazine Who What Wear with a brand new interview! A new photoshoot was released along with the interview, and we’ve uploaded it to our photo gallery. Unlike most actresses I interview, Elle Fanning is someone I’ve met before. During my time working at Rodarte, I spent time with the young teen on the set of photo shoots (like one lensed by Bill Owens), short videos, and fittings for red carpet appearances as she was carving out a path to become A-list star. On set, I would chat with Elle, and with her mother or grandmother, who always accompanied her to the projects she was filming. You could immediately sense how grounded, and very outside the Hollywood norm, they all were. This was perhaps best summed up when one day I received a box filled with a vintage vanity set (an elegant mirror, soapbox, and comb in retro pastel shades) and a handwritten note from Fanning—a rare and thoughtful gesture, especially from someone who didn’t yet have her driver’s license. Fast-forward to 2019. It’s been at least five years since I’ve worked with Fanning, and her fame has only catapulted. She’s played Princess Aurora opposite Angelina Joie in Maleficent (with an upcoming sequel scheduled for release in October), starred in her second film directed by Sofia Coppola, and has been signed as the face of Miu Miu and L’Oréal. As I arrive to meet with Fanning, I don’t expect the actress to recall our time working together years earlier, but as she walked in, she turned to give me a hug and one thing is immediately clear—she’s unlike most celebrities I’ve met. We’re sitting in a room at the Four Seasons, a Beverly Hills hotel backdropped by a palm tree–lined street, where vintage Mercedes convertibles line the valet station and a statue of Marilyn Monroe (fittingly, one of the actress’s Hollywood idols) greet guests at the entrance, and Fanning is dressed in a black puffy-sleeved Co dress cascading to her ankles, with pointed black heels, winged eyeliner, and blonde hair sweeping past her shoulders. She is a day away from the L.A. premiere of Teen Spirit and a week from her 21st birthday, and brimming with anticipation for what lies ahead. When pressed to give us a clue about her red carpet look for the Teen Spirit premiere the next day, Fanning looks down at the dress she’s wearing, and then to me with a glimmer in her eye. “Well, it’s not black,” she says. Though she holds back any hints, she confesses it will be a departure from the looks she wore on the red carpet as a teen. “It’s been fun to experiment with things that maybe I couldn’t wear when I was younger,” she grins. Ultimately, I spot the look Fanning wears to the premiere the next day: a frothy bubblegum pink lace Rodarte dress from Kate and Laura Mulleavy’s fall 2019 collection worn with a bowed headband in a matching shade. It’s exactly what I could have guessed Fanning would wear. 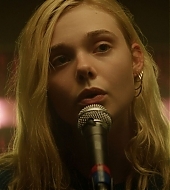 Fanning’s starring role as Violet Valenski in Teen Spirit, a film produced by La La Land’s Fred Berger, isn’t one she was approached with. Unlike many of the films she has worked on before, this is a project she pursued. I didn’t realize Fanning could sing (really, actually sing) until I sat in a theater for a screening of the film—and it turns out the producers didn’t either. We continue to discuss music, performances she saw growing up, and how that translated to the big screen. “My first concert I ever went to was Gwen Stefani when I was nine and in Budapest,” says Fanning, “I think Gwen Stefani would definitely be an idol for Violet.” Leading up to shoot days, other musicians inspired her as well, and she prepared for the film by studying performances of pop artists like Katy Perry, Taylor Swift, and Ariana Grande. “I tried to take from a lot of different artists just as Violet would try to emulate,” she says.